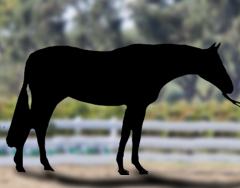 QUESTION: How do you like to see a horse stood up for conformation? What can an exhibitor/handler do to show off his/her horse? Conformation is judged in classes within a hunter division, in a distinct Conformation Hunter division or in breeding classes. Judges are evaluating quality, substance and soundness of horses in judging conformation. Judges must penalize but not necessarily eliminate horses with structural faults, defects and blemishes in areas which might impair their activity and durability. Horses are usually stripped (saddle removed) for conformation judging except in an Under Saddle class. In-Hand classes, also called “model” classes, are non-riding classes where the horse is presented to the judge “in hand” meaning that it is led by a handler on the ground. The horse wears only a bridle. The animal’s conformation is judged, as well as its movement and soundness. A rider or handler can stand his/her horse up to show off his horses best conformation attributes and minimize his horse’s conformation faults. We asked our judges how they like horses to stand up and any advice they can give handlers and exhibitors to best show off their horse’s conformation.